22 1/2" diameter x 25 1/2" Ht. 106 Lbs. Durable TGIC powder-coated finish for indoor or outdoor use. 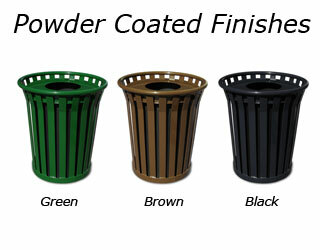 Four powder coated colors available. Durable, long-lasting flat bar steel construction. Durable black plastic liner is included. Anchor kit, lid attachment kit and built-in leveling feet included. Call for additional products and product information. Our 24gal. 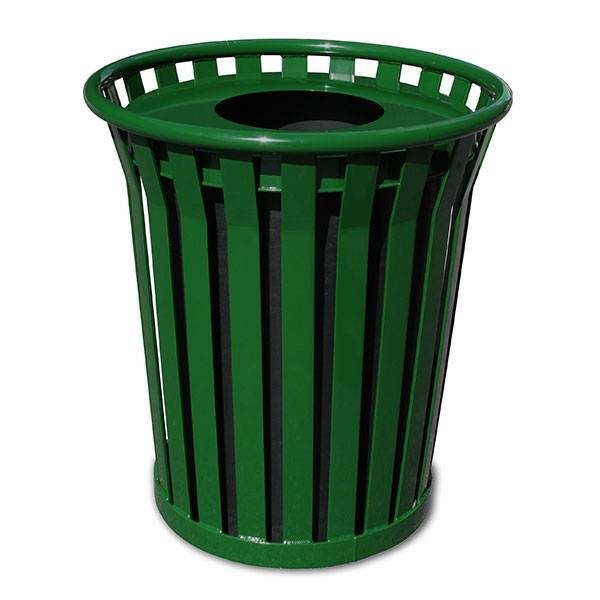 Wydman Slatted Trash Receptacle is the perfect trash can for Malls, Shopping Centers, Fast Food Restaurants and any business that requires a large capacity sized garbage can. It can withstand any commercial application and any weather mother nature throws at it. Three color choices are available. Comes with a 5 year commercial warranty! Best of all...Made in the USA! Call or email National Outdoor Furniture today for a quick quote!